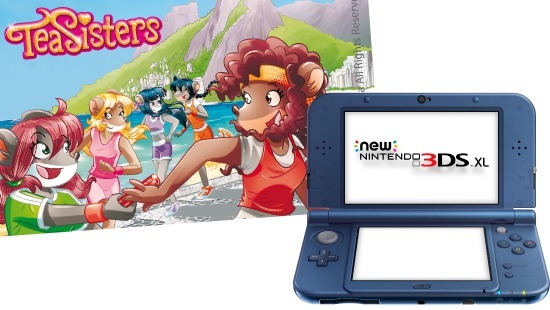 Atlantyca has signed a new licensing agreement with Nintendo to provide young users with a variety of themes for Nintendo 3DS, New Nintendo 3DS and 2DS system to feature Atlantyca’s popular “Thea Sisters” brand. Commencing in June, Thea Sisters’ images, unique icons and backgrounds will be incorporated within a range of personalized Nintendo 3DS HOME Menu themes that will be purchasable for Nintendo 3DS, New Nintendo 3DS and 2DS system owners. The new deal sees Thea Sisters themes expanding their reach to include all European Economic Area, South Africa, Australia and New Zealand. The new deal trails Atlantyca’s original agreement with Nintendo, back in March 2015, announcing the company had signed a licensing agreement with Nintendo for Geronimo Stilton Classic, and “Geronimo Stilton” the animated series (seasons 1 and 2) for Australia, New Zealand, and all of Europe through 2020, with a selection of new and updated themed graphics and images for the both the Geronimo Stilton and Geronimo Stilton animated brands. Nintendo 3DS HOME Menu themes add an extra level of personalization to a user’s Nintendo 3DS, New Nintendo 3DS or Nintendo 2DS system, including custom background music, background images, icons and sound effects. Themes can be purchased and immediately downloaded from the Nintendo 3DS Theme Shop, which is accessible via the HOME Menu of a user’s console. “Today’s children are all about their hand-held devices. As part of our consumer marketing efforts, Atlantyca is committed to raising brand awareness in the digital and interactive space, so this deal marks a very exciting time for us,” noted Marco Piccinini, Licensing Manager, Atlantyca Entertainment. “With over 18 million copies sold to date, translations in over 18 languages, Thea’s Sisters popularity has grown extensively resulting in a greater evergreen fan base. We are honored to have Nintendo back as one of our leading partners and look forward to working with them again with these two wonderful children’s properties. The adventures of five young “detective” friends, narrated with a gripping and lively style. Stories set in: New York, Paris, Beijing, Australia, The Moon, Japan, Scotland, Egypt, India, Spain… Five very special girls: more than friends… sisters! They speak the reader’s language, feel the same emotions and live the kind of adventures their readers desire.